Bill and I had planned to go to Montreal last year when we visited our family in Vermont, but weren’t able to do so because we were inept in the whole renewing-our-passports thing and they didn’t arrive in time. This time we happily held them in our grimy little fists to hand to the border guards as we passed from Vermont into Canada. The most notable thing was that you could immediately tell that you were in a different country. And I’m not just talking about being greeted by the border guards, who didn’t seem terribly concerned about us. The landscape changes almost immediately from the woods of Vermont to farmlands of Quebec. I seriously would have thought I was in Nebraska except for the fact that the architecture was also quite unique. 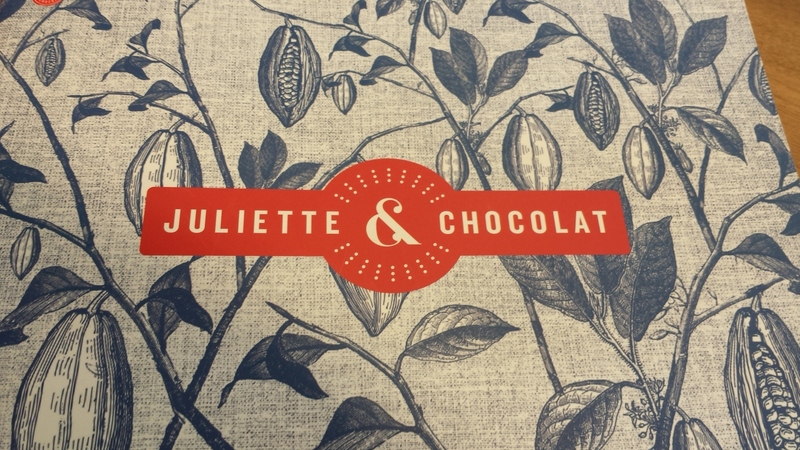 Knowing us as well as they do, the first thing that Heather and Lauren did was to take us to a chocolate shop, featuring all manner of things chocolate. Bill and Joseph thought they had died and gone to heaven for sure. In fact, they both ordered the same thing – a chocolate lava cake with a side of, yes, chocolate. And the second thing they did was take us to an outdoor market, probably the most beautiful market I have ever seen, even in Europe. 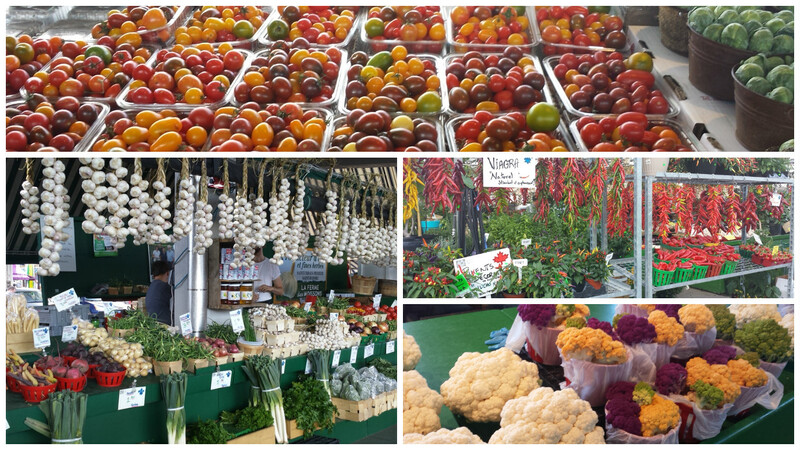 While there were shops featuring seafood and meat and patisseries and boulangeries, it was the vegetable market that amazed me the most….. This photo is notable in large part because it’s about the only one taken this trip of Micah in which he doesn’t have his tongue out or is making some sort of face. He’s 4, donchaknow. 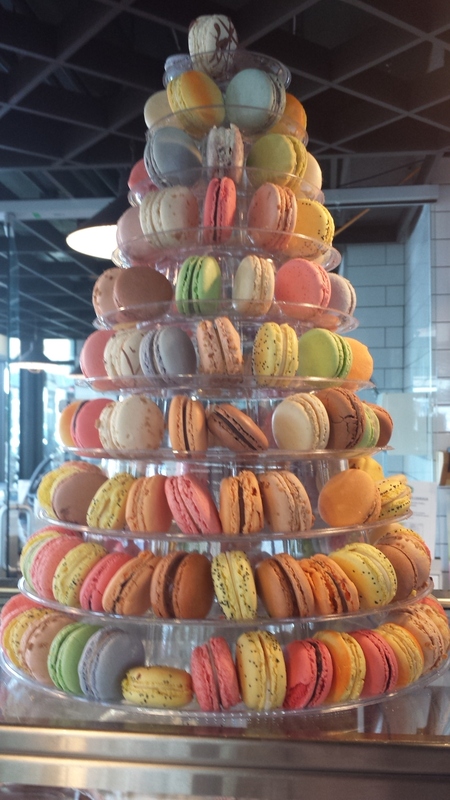 Being me, one of the things I most wanted to do while visiting Montreal was to experience local food. Lauren, who grew up in Vermont and has spent a fair amount of time in Montreal, told me that there were a few food things for which Montreal was known – mussels, smoked meat sandwiches, and poutine. Poutine? I had never heard of it. So on Friday night we went to a restaurant appropriately called Poutineville, featuring all sorts of options for poutine. 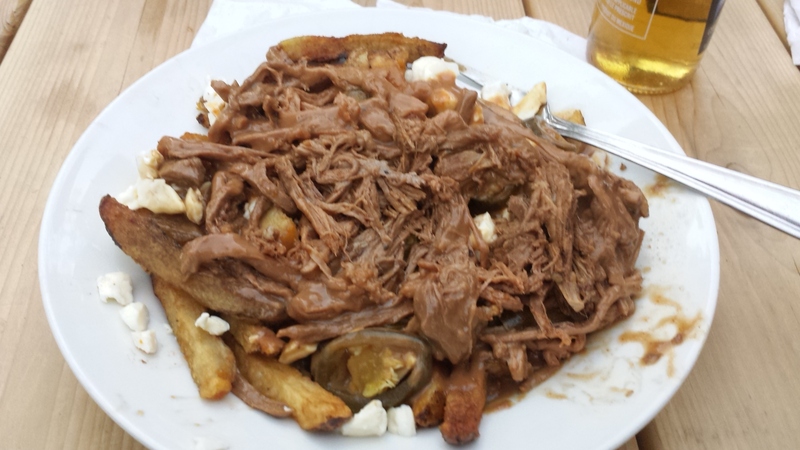 Poutine is basically a dish consisting of French fries covered in cheese, some sort of meat, and some sort of gravy. 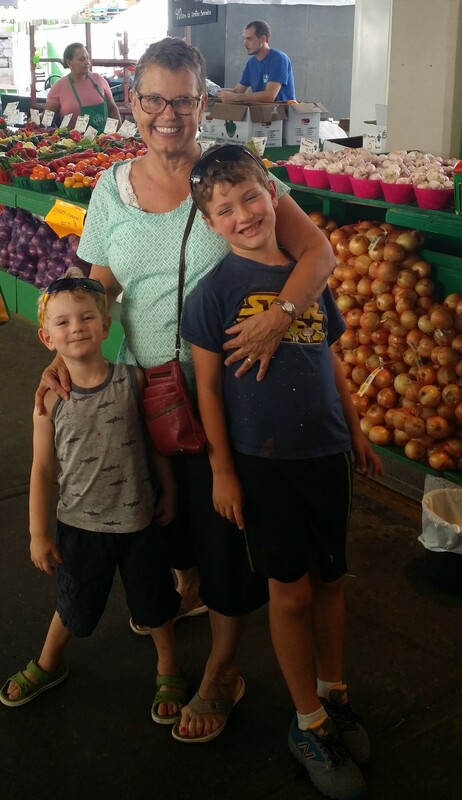 I had the house specialty, which was French fries smothered in a red wine gravy, cheese curds, and braised beef…..
We arose early the next morning and went to yet another market, where we quickly spotted a beautiful pastry shop. Lauren and I agreed to wait in line while the rest found a place to sit. The shop was extremely busy, and Lauren and I stood in line for probably 15 or 20 minutes before we realized we should have grabbed a number. Have you ever seen the movie Beetlejuice? You remember the scene where Beetlejuice grabs the number – something like 1,032,587 – and looks at the screen and sees they’re on number 6? We were Beetlejuice. Nevertheless, time passed quite quickly once we grabbed our number and in short order we all were eating croissants so fresh, warm and crumbly that it brought tears to my eyes. 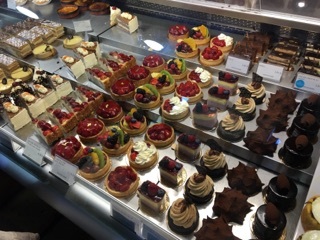 And, yes, also a second visit to the patisserie and another 20 minutes in line. 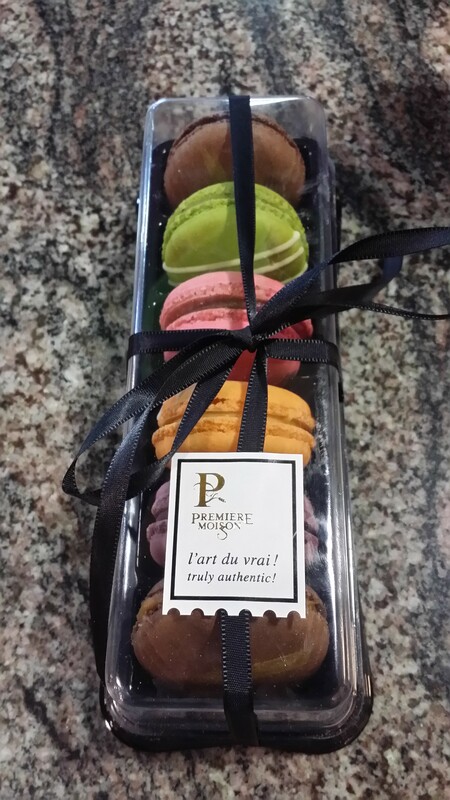 I also bought some of the beautiful macarons for which the French are famous. 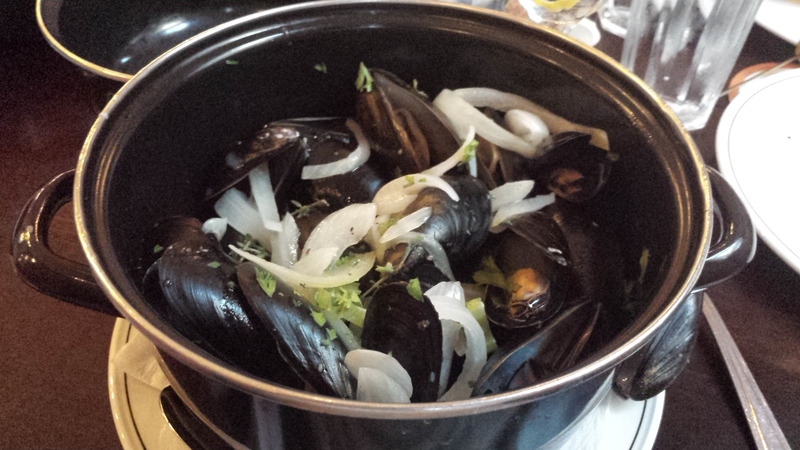 They deserve their fame as they are light and delicious, as well as so very pretty…..
Our final Montreal food treat was a visit to a brasserie at which we got our mussels. Well, actually, Bill shockingly ordered a steak, but Heather and Lauren and I each ordered a different kind of mussel dish and shared. I’m not sure when I’ve ever tasted anything so very good. And also beautiful….. 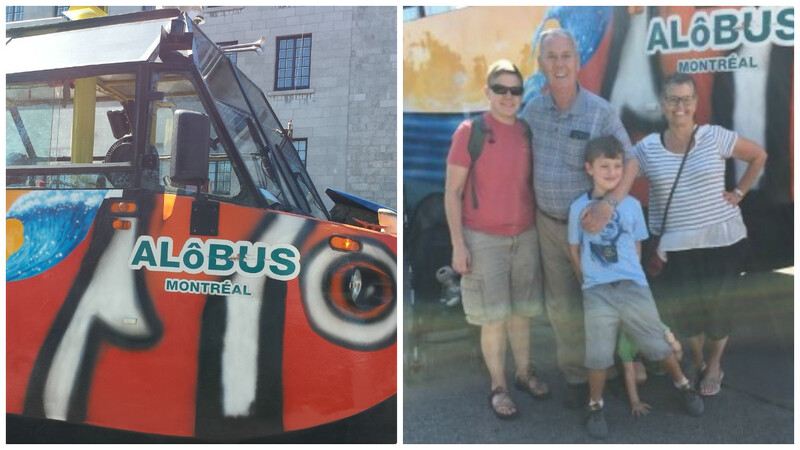 I will admit that perhaps the highlight of our brief trip to Montreal was what probably would rank among the top three tourist attractions – a city tour on an amphibian bus. Yes, my friends, we toured Montreal from the bus, which then drove into the St. Lawrence River from which we were awarded with another view of Montreal. Joseph, Micah, and Nana all had eyes the size of quarters as we drove into the water. It was a grand treat. And we had a wonderful visit of Montreal, without a doubt. I loved hearing the beautiful French language spoken by the people around me and experiencing the feeling of being in Paris, and yet, wasn’t. I am motivated to return, and to add Quebec City to my itinerary. In the meantime, I’ll get my fix by reading the Inspector Gamache books by Louise Penny. The pictures of the market are beautiful. The food looks amazing. I can’t believe how tall Joseph has gotten! Micah is tall too. Joseph is the tallest in his class! I am taking notes and planning a visit. You really ought to. It’s amazing. The display of cookies on a 10-tiered plate was amazing. Really like that idea as well as how the gift wrapped cookies were packaged. 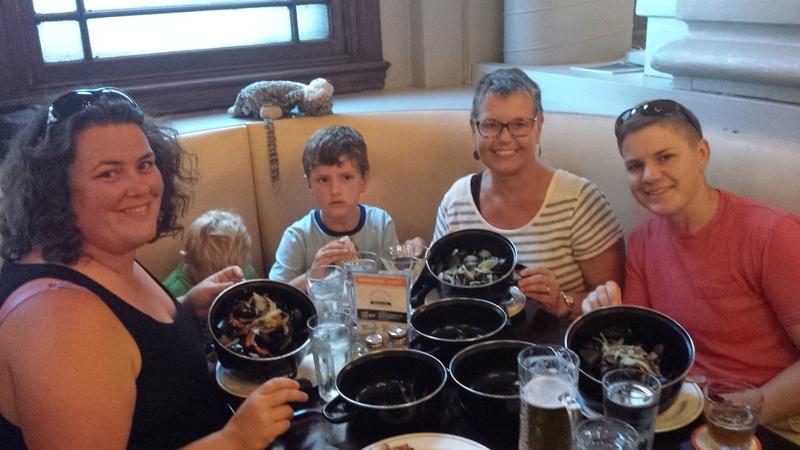 How the muscles were served…..who knew? Creativeness abounds. Thoroughly enjoy your travelogues. I thought the way they packaged the cookies was cool too. That’s the way they do it in Paris too. I want to know how that dish with the fries was! Fries and gravy? YES, PLEASE.